Every two years, the Oregon Student Association runs the largest nonpartisan voter registration, voter education, and get out the vote drive in the state. 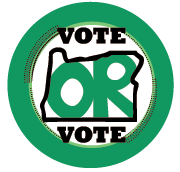 Our campaign is called “Vote OR Vote” because Oregonians really only have one choice. Reach out to our Communications Director, Andrew, to get connected with a staff member in your region. Check out out the voter resources page to ensure you’re registered and can get your ballot in!